The thyroid is a brownish-red, highly vascular two-inch gland. In humans, it has a "butterfly" shape, with two lateral lobes that are connected by a narrow section called the isthmus. The thyroid is located just below the surface of the skin and therefore is readily accessible for examination, both visually and by palpation. The thyroid plays an important role in regulating how fast your body is running (metabolism). In fact, the T4 and T3 hormones are responsible for controlling the rate of metabolism of every cell in the human body. Iodine is necessary for the production of both hormones. The levels of hormones secreted by the thyroid are controlled by thyroid-stimulating hormone released by the pituitary gland. 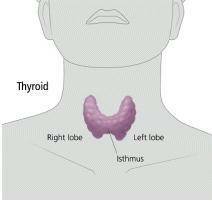 What are Thyroid related conditions? Thyroid function is directly related to Adrenal function, and Thyroid symptoms can therefore have a similar presentation as Adrenal Fatigue symptoms. Hypothyroidism -- An underactive thyroid. Hyperthyroidism -- An overactive thyroid. Goiter -- An enlarged thyroid. Thyroid Nodules -- Lumps in the thyroid gland. Thyroid Cancer -- Malignant thyroid nodules or tissue. Thyroiditis -- Inflammation of the thyroid. How can I improve my Thyroid health? Thyroid function is directly connected to Adrenal function, both of which are directly affected by how you handle stress. Reducing stress is therefore vital to improving your Thyroid health. Ask your health practitioner to check for underlying causes (e.g. iodine loading analysis (24 hour urinary collection), hormone imbalance, environmental toxicity, inflammation). Quality Omega 3 together with multi-vitamin and mineral supplements may also be beneficial in improving Thyroid health and related conditions.